"All mangled up." That's how Tammy Allen is describing her horse, Sugar, after she says the animal was attacked by TWO PIT BULLS yesterday while in her pasture. Allen is upset because she says SCRAPS hasn't been out to check out the horse and they've done nothing about the pit bulls. Jason Muir, who lives in the house where Sugar is boarded says he saw the first dog chasing Sugar through the pasture. Then he saw a second one and that's when he jumped up and came outside. "They got a hold of her throat and latched on and she was running with the dog hanging from her throat," says Muir. "She's severely torn up," says Allen. "There's skin hanging and her throat is ripped open." Allen gets choked up thinking about what Sugar went through. The pit bull attack happened Thursday afternoon and since then she says her horse hasn't been the same. "She's scared to death of everything," says Allen. "I had the vet out here last night and we couldn't even get a halter on her. She went clear to the other side of the pasture." Allen has since been able to get close to Sugar but she's upset because SCRAPS told her she'd have to wait until Saturday before they could come out to take a statement. "I wanted an officer out here and I wanted him out here now." Nancy Hill, Regional Director of SCRAPS says they prioritize every call, but when she looked at the notes from this case she thought they should send an officer sooner. "I'm very concerned about this because it does sound like a brutal attack so I've asked an officer to respond now to at least put the dog owner on notice." If SCRAPS deems the dogs dangerous the owners will have to register them, have special liability insurance and have a special enclosure in place before they would be allowed to get the dogs back. Allen says she believes the dogs should be destroyed. 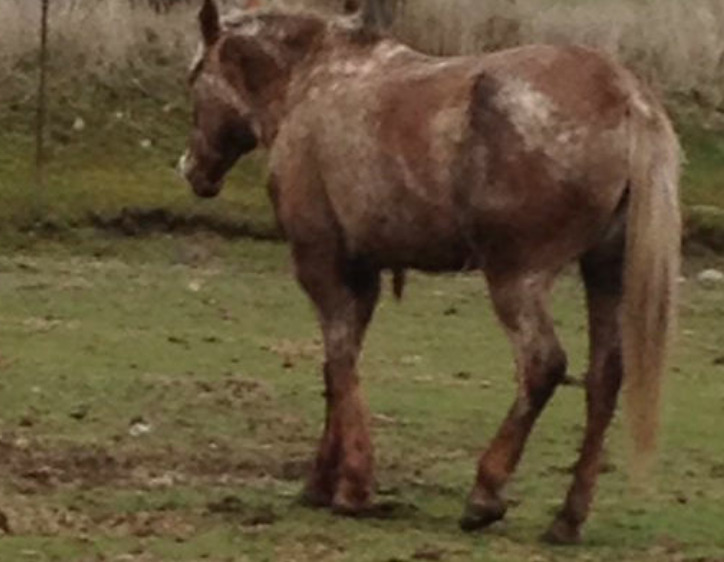 "If the dogs could do that to a 1,000 pound horse, they can literally kill a child," says Allen. The family has put together a GoFundMe account to help pay for the vet bills and long-term care that the horse will need following the attack. CLICK HERE to visit the family's fundraising page. Note that the law doesn't say you have to kill the pit bulls while they're in the act -- just that you can kill them. Obviously, you'd be trespassing if you walked onto the owner's property to as yet shoot them deservedly and legally dead, but that's a minor infraction. You can at any rate shoot them dead the next time you see them off their owner's property. I don't see why anyone in Washington would wait for pit-loving 'authorities' to deal with pit bulls that attack livestock. The law automatically demands that such pit bulls be kept confined in future, no need for pit nutter AC to decree that. But again, the right to kill these pit bulls also flows directly from the law, no need for any 'authority' to mediate and decide this, because the law already has.